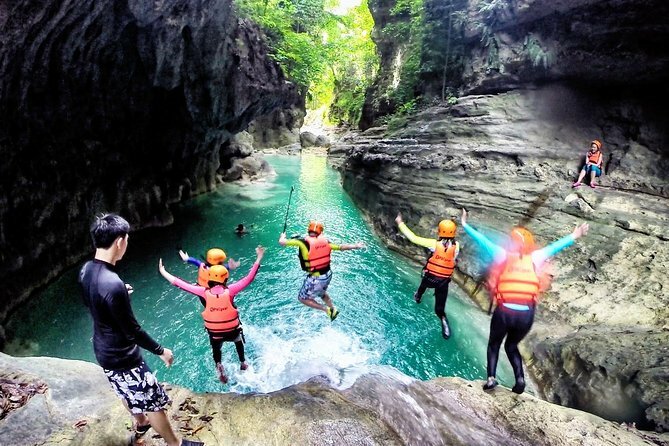 Join this day-trip and experience canyoneering thrill in Cebu. Enjoy a day away from hustle and bustle of the busy city with this extremely fun activities. However, this tour is not for the faint hearted.A hearty lunch and round-trip transfer are included. Please remember to bring a waterproof bag and clothes to change as you will get wet after this activity. This full-day trip starts with a hotel pickup at southern part of Cebu. A 3-hour driver passing thru charming small towns, picturesque seascapes and winding roads will lead you to the town of Alegria. Upon arrival, enjoy a brief motorcycle ride to the jump-off point. Don on your life-jacket, hard hat, wetsuit (or aqua leggings/rash guard), aqua shoes and aqua bag to hold your things (although less is more) and you're good to go! The technical guide will prepare you up with the do's and don't and simulate the tour highlights by letting you try jumping at the river from a lower level first until you get a hang of it. Once ready, you move on to the first of many jumps of varying heights 5ft-30ft. Feel the rush! Your heart thumping strong and wild, your mind tells you not to but your heart wants to! This is downstream canyoning, perfect for beginners where walking, scrambling, climbing, jumping, and swimming is expected. You will navigate your way through Kanlaob River where water is very blue, simply irresistible! Mostly you'll be in the water either swimming, floating or walking. Some parts of the river are deep and some are rocky so you better swim carefully. There are amazing rock formations and small caves. Wherever you look, it is just beautiful that you want to capture everything on your water-proof cameras. You can play with the streaming waters or relax for a bit. After traversing the river and jumping from some waterfalls, you'll be hiking through a forest until you reach the third level of Kawasan Falls where a hearty lunch awaits. More swimming will complete your extreme Cebu adventure!